The liver is very rich in amino acids and all substances that are involved in hematopoiesis, so the dishes from the liver, past the minimum culinary processing, prescribed for anemia. 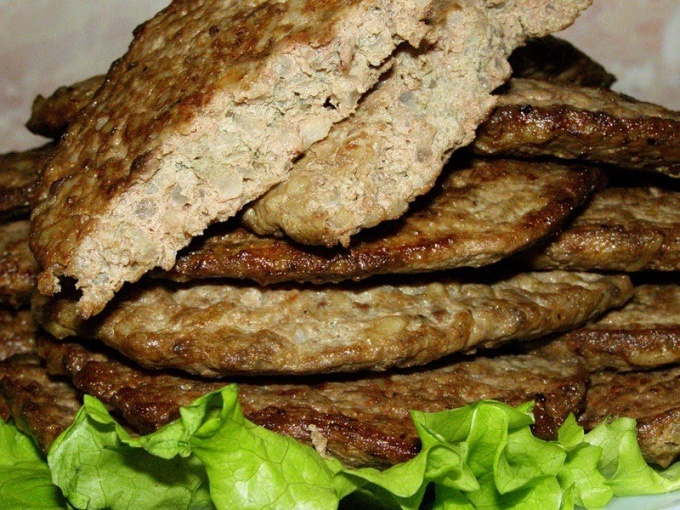 Liver pancakes, or liverworts, is just such a dish, it is passed through a meat grinder liver, and prepared the liverworts like regular pancakes in a few minutes. Rinse the liver clear from the films and pass along with purified onion through a Mincer with a fine grid. Carrots grate on fine grater and add to the liver. Then add the flour, sour cream, egg, salt and pepper, mix thoroughly (corn flour should be swell for 10-15 min.). Preheat the pan, pour oil, put the pancakes and fry on both sides until Golden brown. Soak liver in water, rinse, remove the film and ducts, cut into large chunks. Mince the liver and fat, add slightly beaten eggs, salt, flour. Add the flour in such quantities to get the consistency of dough for pancakes. Liverworts lay the spoon on a heated pan with vegetable oil. Fry one side, flip to the other and close the pan with a lid turn off the heat and leave to walk under cover in a warm place. Wash the liver, Pat dry, cut into pieces and mince, add salt and pepper stuffing. Wash rice, boil water, put back the rice and one onion, add salt, boil until tender. Mix the minced liver and rice until smooth. Take the pork fat netting, cut it into squares, put in the middle of each square stuffed with rice and liver and turn into the envelope. Put the pan on the fire, heat, pour vegetable oil, fry on both sides of the liverworts and put in a deep pot. Wash the remaining onions, peel, cut into cubes, fry in a small amount of vegetable oil and add together with cream in a deep pot to the liverworts. Simmer the liverworts together with onion-cream sauce for 10 minutes.